DISC works by measuring four fundamental factors in a person's behaviour, and using those four factors to describe their personality by developing a 'DISC profile'. How do we go about creating a profile of a personality? We start, naturally enough, with a questionnaire: a set of questions structured to focus on certain key elements. For DISC, these questionnaires typically consist of a series of just twenty-four questions, and each question is made up from four different options (which can be simple adjectives or descriptive phrases). The person answering the questions chooses two of these options, one that best represents their behaviour, and one that's least relevant to their general approach. Once we have those answers, they can be rated and calculated to produce a set of results. With an automated DISC system like Discus, of course, this is all done automatically. An obvious question here might be: can we measure an entire personality with just four factors like this? In fact, we can't, but what DISC can do is focus on a series of key traits that directly affect a person's behaviour and performance. There will always be other factors to consider - notably things like experience and knowledge - but DISC focuses on more fundamental questions about the ways a person will naturally react in different situations. This example shows a highly Assertive person, but generally less Open to others. A person like this tends to be determined and demanding in style. This is far more Open person, sociable and accepting in their general approach, tending to be less direct or forceful, but working more effectively as part of a group. From basic information like this, gleaned from a DISC questionnaire, we can put together a graph showing the relative Dominance, Influence, Steadiness and Compliance that drive a person's approach to their life and work. In fact we can go further and build a series of graphs that look at different motivations in different situations. If you're interested in finding out more about the technicalities behind DISC, Discus gives you comprehensive reference material that covers all of this in detail, and we even provide an interactive online Training Course that explains DISC from first principles. Bear in mind that you don't actually need to understand the technicalities behind DISC to use it. Discus takes care of the interpretation for you, with an advanced expert system that produces a personality report in plain language. 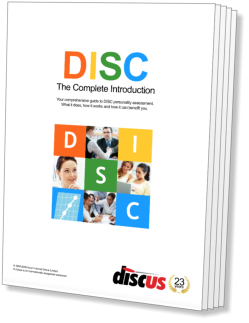 Explore DISC in depth - history, principles, theory and practice - with the ultimate online guide. Understanding DISC gives you a comprehensive reference source for the DISC personality assessment system. Here, you'll find plenty of background about the theory, as well as practical features such as interpretations for common profiles. Discus reporting power: This explanation of the workings of DISC gives you a useful grounding in the way things work, but it's not essential to using a DISC profiler. Discus reports are created in plain language, so they're just as readable whether you're a layman or a DISC expert. D: Dominance: The factor of drive, determination and self-reliance, relating to independent, self-motivated types of people. I: Influence: The factor of sociability, friendliness and enthusiasm, relating to outgoing, expressive types of people. S: Steadiness: The factor of patience, persistence and stability, relating to reliable and thoughtful types of people. C: Compliance: The factor of structure, accuracy and precision, relating to analytical and organised types of people.